I got out of DC yesterday and spent several wonderful hours wandering around polyface farms in the Shenandoah Valley of northern Virginia. 3 hours of a drive from DC, it was well worth the trip as we managed to shuttle past the persistent rainstorm settled atop DC for the beautiful weather at Polyface Farms. For those of you who don’t know who Polyface farms is, the best way to explain it is this 18 min talk from my favorite place for outside the box thinking. Micheal Pollan who speaks in this video, also wrote the Omnivores Delimma, the often read discusion of how food affects our modern living. Pollan and this book are apparently directly responsible for 15,000-20,000 visitors to Polyface yearly. I haven’t read it yet, but got the Audio CDs so I should hopefully finish it before the year’s out as I’m now curious about what he says about farming biodiversity. I am of course going about this all wrong I should have read the book and researched the farm before I left, but it’s been a tough several months so I’m glad I managed to get out there at all. I might add that the trip was not only enlightening in the respect of Polyface, but in talking and discussing yet more interesting thoughts and ideas with other couchsurfers. I road out to Polyface with Johnathan and RanaJoy, the former who is an immigrant from Peru and works for a law firm here in DC who majored in economics, the latter who originally from India and is a professor of economics at Southern Maryland university. 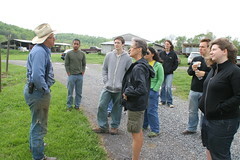 Was a wonderful discussion of many topics far from econ but all of which was just as fascinating as the farm. I digress however, the farm itself is a brilliant bit of ingenuity and innovation. I doesn’t look all that different from an average ranch in many respects. Lots of open land and clusters of buildings. I might qualify this as saying that it’s far more a ranch then a farm by my understanding of the definition. There is a garden, but it’s literally just that a garden. They grow veggies for the staff and family rather then for the public. 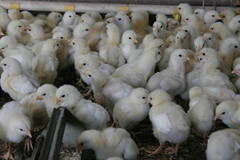 Rather they focus on the thousands of chickens and 500+ cattle plus a few pigs, geese, and rabbits. 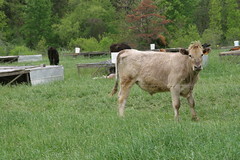 What sets them apart from most farms is that they grass feed all of those animals. They don’t buy and haul corn feed in to fatten the chickens, nor for the cattle. Using simple electric fences they corral the cattle in movable sections on their pasture, then they follow the cows with chickens who scatter the poo, eat the bugs that collect in poo, and consume the shorter grass that the cattle has left behind. After the chickens move the grass has been aerated, fertilized, and is let to grow again to start the process over eventually. What’s brilliant about polyface is that they acknowledge the feedback loop we live in and try and use it to their advantage. 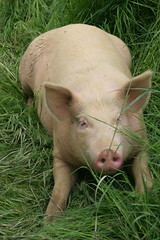 Use bio-diversity of animals and environment to sustain the ground you live on and the community they exist with. The latter is more cerebral, but is an off-shoot of the same thinking. They don’t ship to slaughter houses in Colorado, they feed a few restaurants in Charlottesville (and a few in DC) that doesn’t require a huge carbon foot print. More over the money stays in the region and you have improved localized trade because Polyface and those restaurants are growing by training others to do the same thing inside the valley. Polyface rent’s property, hires an interested person to learn the polyface process, pays him on performance, then set’s him loose after a time to start his own farm. Ironically many of the local farmers in the area don’t know about Pollan and his book nor about why Polyface is special. 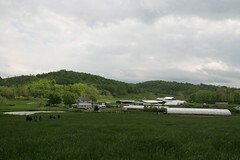 They continue to use commercial farming techniques, even when–Matt indicated–the profit margin between the Polyface way and the commercial way is a different of about $1000 dollars per acre or approximately 6 times the amount a commercial farmer makes. Obviously there are things to be verified and as this is an individual farm, and I have insufficient data to prove this is not a one off event. Still even if they break even making the same method and aren’t destroying the land as well as leaving less of a carbon foot print, they are going to be a long term positive for a world with the food crisis and carbon crisis we are in. Having been to Polyface once, I look forward to returning again. 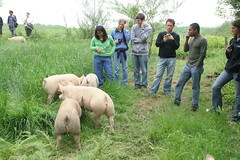 This time to find out more about the intentional bio-diversity, to get some more eggs, sausage, bacon, etc., and to lead others in the self-guided tour around the property. Hopefully I’ll remember to stop by Chipotle on the way through as Chipotle is one of the biggest buyers of the polyface ideas. I have a long history of Chipotle loving and it’s a love hate relationship (1000 calories of love and knowing i’m going to have to work it off…). Some of you may remember me eating 2 burritos a day for a while in Denver. I stopped and now eat it only occasionally because I can’t afford that much burritoful love, but I still talk about it and am still known as Chipotle to my Antarctic friends. Having now seen up close one of the reasons I believe in Chipotle’s model, I look forward to seeing it’s wonderful effects on our wacky fast food nation.